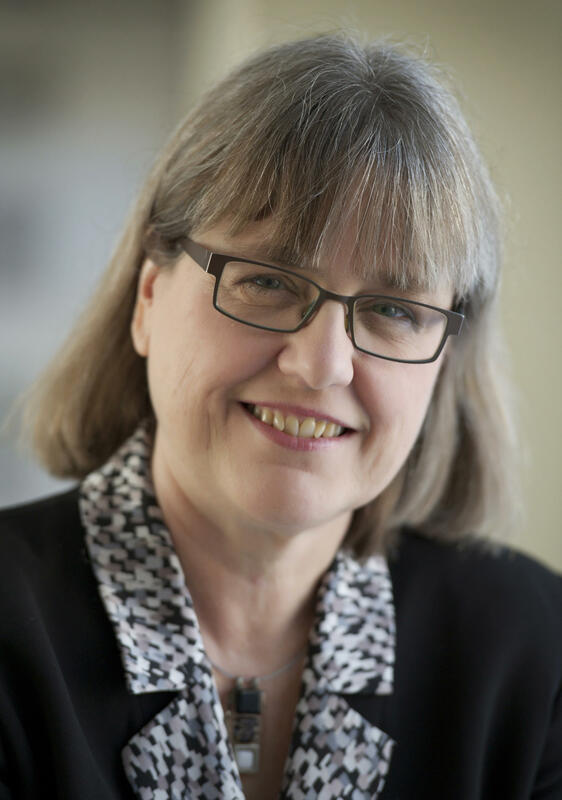 Canadian professor Donna Strickland, American Arthur Ashkin and French scientist Gérard Mourou won the 2018 Nobel Prize in Physics announced on Tuesday for work in laser physics. Strickland is the third woman to win the prize, first awarded in 1901. 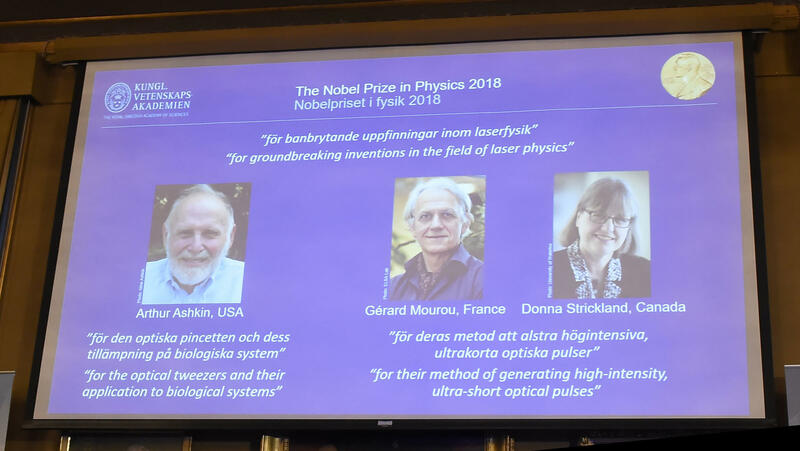 A screen displays portraits of Arthur Ashkin of the United States, Gérard Mourou of France and Donna Strickland of Canada, who won the 2018 Nobel Prize in Physics, at the Royal Swedish Academy of Sciences on Tuesday in Stockholm. 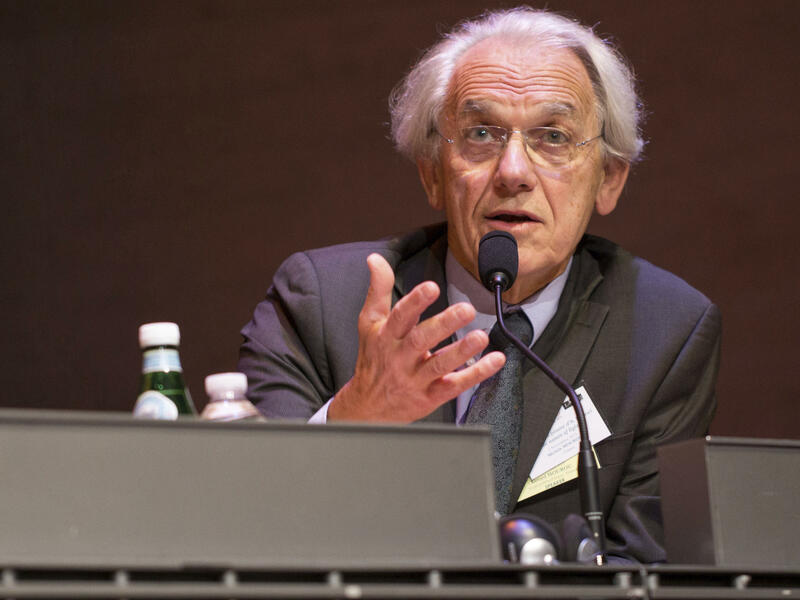 Gérard Mourou, one of three scientists to win the 2018 Nobel Prize in Physics, is shown during a conference in Paris in 2015. Arthur Ashkin of the United States and Canadian Donna Strickland also share the prize. Strickland is the third-ever woman to win the prize, first awarded in 1901. A reporter asked the physicist how it felt to be in the company of so few women. "Really? I thought there might've been more," Strickland replied. "Obviously, we need to celebrate women physicists, because we're out there ... I don't know what to say, I'm honored to be one of these women," she said. Ashkin is known as "the father of laser radiation pressure." Born in 1922 in New York, he was the first physicist to observe optical gradient forces on atoms and observe optical trapping of atoms, and the first to perform laser cooling of atoms, known as "optical molasses," according to the Optical Society. He received his Ph.D. from Cornell University. Ashkin's optical tweezers are pretty much what they sound like — extremely small objects that can "grab" particles, atoms, viruses and other living cells with their laser beam fingers. "This new tool allowed Ashkin to realize an old dream of science fiction – using the radiation pressure of light to move physical objects," the academy says in its press release. Mourou, born in 1944 in Albertville, France, and Strickland, born 1959 in Guelph, Canada, have worked together since 1985, when they published a revolutionary article that would become the basis of Strickland's thesis. Mourou and Strickland are honored for their "chirped pulse amplification" — a technique that has allowed researchers to boost the power of lasers. The technique boosts the power of a pulse of laser light. It is used most frequently in laser eye surgery, but there are many other applications, including in ultrafast cameras used for imaging molecular processes. The technique's "innumerable areas of application have not yet been completely explored," the academy says. Last year's physics prize went to three Americans who used abstruse theory and ingenious equipment design to detect the faint ripples in the universe called gravitational waves. The three winners announced Tuesday bring to 210 laureates who have won the physics prize since it was first awarded.